Sport fans are rejoicing at the opening of the NBC Sports Grill & Brew. This new restaurant at Universal Orlando’s CityWalk is the perfect place to watch your favorite team and get a great meal. Although the grand opening isn’t until October 23, 2015, the doors are open and news of this new Orlando restaurant is spreading. There are several reasons why everyone is so excited about this new dining option. Location: CityWalk has many dining options, and the NBC Sports Grill & Brew fills in where the NASCAR Grille left off – a great place to watch sporting events with friends. Even though it is on Universal Studios property, you do not need a theme park ticket to eat here. You may have to pay to park depending upon your arrival time. ORLANDO TOURIST TIP: Arrive after 6:00 p.m. and parking is free if you are a Florida resident (unless a special event, such as Halloween Horror Nights is taking place). After 10:00 p.m. parking is free for everyone. The parking garage is located at 6000 Universal Boulevard, Orlando, FL 32819. Sports Galore: From the massive high definition stadium screen to the 90+ smaller television screens, several sporting events are broadcast at one time. At the NBC Sports Grill & Brew over a dozen screens can be viewed at one time from several tables. ORLANDO TOURIST TIP: In the center of the first floor of the new restaurant hangs a jumbotron with several screens. You should be able to view your game easily if you can position yourself near this area. The Menu: The “Playbook” consists of appetizers, salads, sandwiches, burgers, entrees, sides, desserts and a child’s menu. There are plenty of choices and the cost ranges from a $10 salad to the $40 New York Strip Steak. Most dishes are in the $20 range, including the Grand Slam hamburger. Unless you are very hungry, you’ll be taking some of it home! Other featured items include a Cuban meatloaf sandwich, cedar planked salmon, crab scotch eggs, midwest ribs, sliders and house-made kettle chips. Everything is created in an open kitchen on fire grills. The NBC Sports Grill & Brew features over 100 beers on draft and in bottles. Just about every shade can be selected: gold, red, brown, pale, fruit, ciders…you get the idea. Some beers are exclusive of this new Orlando restaurant, so be sure to ask your server for a recommendation if you are wanting something unique. If dining upstairs, chances are you’ll be able to see what’s on tap and pick out something to delight your taste buds. ORLANDO TOURIST TIP: An outdoor beer garden offers a great place to kick back and throw back some suds. You won’t miss the dinner show either. There are televisions outside! The NBC Sports Grill & Brew is a fun place to take your children, especially if they like to play table games. Foosball dining tables are located on the first floor. Eat and play at the same time! Who wouldn’t want in on this family night out?! If you are seated upstairs, be sure to check out the banners featuring NBC’s identity transition over the years. For some adults, it will be a trip down memory lane. Reservations: This new Orlando restaurant is bound to be busy, especially during the weekends and evenings when popular sporting events are being aired. 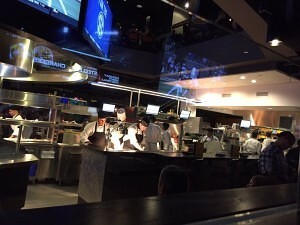 It can seat up to 500 guests, however, many guests may stretch out their meal time if their team is winning! Expect the hours to be from late morning to 11:00 p.m. or midnight. 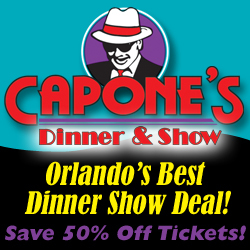 For reservation information, call 407-224-FOOD (3663). Meal & Movie Deal: It is unlikely that the NBC Sports Grill & Brew will be a participating restaurant in Universal’s Movie and a Meal deal. At least not in the early stages of its opening. Currently only four restaurants are offered at CityWalk (Bob Marley–A Tribute to Freedom, Fusion Bistro Sushi & Sake Bar, Jimmy Buffett’s® Margaritaville®, Pat O’Brien’s®). ORLANDO TOURIST TIP: If you really like sports, why not try the Meal & Mini-golf deal? The cost is $22.48 +tax. The Hollywood Drive-in Golf is a blast from the past!